Approx. Overall print size 16” x 26” / 40cms x 66cms. 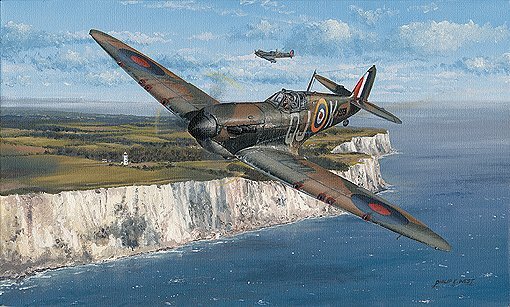 The White Cliffs at Dover patrolled and protected by two magnificent Spitfires. A sight to bring back memories of days, thankfully long gone, when the future of Great Britain was at stake. Air Commodore Peter Brothers DSO, DFC & Bar learnt to fly at the age of 16 and joined the RAF two years later in 1936. He first saw action in1940 when as a Flight Commander in 32 Squadron, based at Biggin Hill, he flew his Hurricane against the fighters and bombers of the Luftwaffe. He recalls this an intensely busy period, during which he shot down an Me109 - his first enemy aircraft; by the end of August that same year his tally of enemy aircraft shot down, increased to eight. Awarded the DFC, he was transferred to 257 Squadron where he joined Bob Stanford-Tuck as Flight Commanders. Promoted in 1941 to Squadron Leader, Pete Brothers then took command of 457 Squadron (Royal Australian Air Force), equipped with Spitfires. A year later when 457 Squadron returned to Australia, Pete took command of 602 Squadron. In the early autumn of 1942 he went on to become Wing Leader of the Tangmere Wing, succeeding his old friend Douglas Bader. By the end of the war Pete Brothers had amassed 875 operational hours over a 44-month period. He was credited with having personally shot down 16 enemy aircraft and damaged many more. He later went on to command 57 Squadron during the Malaya Campaign. Upon return to the UK Pete Brothers joined the V-Force, flying Valiant-4 jet bombers. He retired in 1973. Alex Henshaw MBE has amassed more hours flying Spitfires than anyone else in the world. He achieved his first solo flight back in 1932, flying the first Gipsy Moth G-AALN. In 1933, flying his own Comper Swift, he was awarded the Siddeley Trophy in the King’s Cup race; the youngest pilot ever to do so. In 1935 he had a narrow escape whilst performing aerobatics in an Active Arrow, which caught fire, causing Alex to bale out. In 1936, flying a Leopard Moth, he was the winner of the first London to Isle of Man race. In 1938 he was the winner of the King’s Cup Air Race in the fasted time ever recorded – an achievement that has never been beaten by a British winning Aircraft. In 1939 Alex broke all records in every class of flight, flying his Percival Mew Gull G-AEXF aircraft from London to Cape Town and back. This record has never been beaten and is recognised to this day as the most outstanding solo flight in the history of aviation. At the outbreak of WW11 Alex was appointed Chief Test Pilot with Vickers-Armstrong at Castle Bromwich, dealing with Spitfire and Lancaster aircraft. A total of 37,000 test sorties were made, which involved 127 accidents, one bale-out and four pilot deaths. A full-scale model of the Mew Gull G-AEXF has been presented to the RAF Museum at Cosford, along with all of Alex’s log-books, trophies, cups and awards. His unique collection of Michael Turner paintings portraying flying incidents Alex has experienced over his 75 years of involvement with aviation, will also be donated to the museum. His last flight in a Spitfire was at the age of 93, in March 2006. In April 1941 he was posted to 92 Squadron at Biggin Hill where he was 'Sailor Malan's wingman. Later that year he was posted to 112 Squadron in the Middle East, where he survived being shot down twice by pilots of JG-27. By February 1942 Neville Duke had 8 confirmed enemy aircraft shot down and three probables. Then followed a second tour with 92 Squadron, flying Spitfire Vs in the North African campaign, before going on to a third tour flying Spitfire VIIIs with 145 Squadron in Italy. He became the Allied top-scorer in the Mediterranean theatre. Neville logged 28 combat victories, 485 sorties and more than 700 hours’ flying, all meticulously recorded in his diaries. After the war, rather than accept a desk job Neville joined Hawker as a test pilot. In 1949, delivering a Hawker Fury to Pakistan, he set speed records for London to Rome and London to Karachi. He went on to become Chief Test Pilot in 1951. On September 7, 1953, flying his famous all red Hawker Hunter, he set a new air speed record of Speed record at 727.63 mph. A full-scale model of the Mew Gull G-AEXF has been presented to the RAF Museum at Cosford, along with all of Alex’s logbooks, trophies, cups and awards. His unique collection of Michael Turner paintings portraying flying incidents Alex has experienced over his 75 years of involvement with aviation, will also be donated to the museum. Air Commodore Eric William Wright CBE, DFC, DFM was born in Cambridgeshire in 1919 and joined the RAFVR in June 1939. He was called up on 1 September 1939 and had completed his training by June 1940 when he was posted to 6OTU at Sutton Bridge. There he converted to Hurricanes and was sent as a Sergeant pilot to 605 Sqdn at Drem on 6 July 1940 and flew with them through the Battle of Britain. He shared a Me110 on 9 September, shared a Do17 on 12 September, damaged a Ju88 on the 13th, destroyed a Do17 on the 15th, probably destroyed two Me110’s on the 27th and damaged a Ju88 on the 28th. Eight more claims after the Battle led to the award of the DFM on 26 November 1940 and a commission the following month. December 1941 saw him in the Far East with 605 followed by a posting to 232 Sqdn at Seletar, Singapore in January 1942 as a flight commander. On the death of the CO Wright took command of the squadron but this was short-lived as he was ordered to re-form 605 by merging 258 and 488 squadrons. He damaged two Japanese aircraft before being captured in March 1942. On liberation he returned to the UK and was awarded a DFC for his earlier service pre-capture. Staying in the RAF he was part of the service contingent at Churchill’s funeral, was made a CBE in 1964 and retired in 1973 as an Air Commodore. Wing Commander Patrick Barthropp DFC, AFC, was born in Dublin in 1920 and educated in England before being engaged as an apprentice by the Rover company. Applying for a short service commission in the RAF he commenced training at White Waltham in 1938 and on completion was sent to an Army Co-operation squadron. He volunteered for Fighter Command and was posted to 602 Squadron after converting to Spitfires. On 21 September he damaged a Do17, shared a He111 on the 27th and shared a Ju88 on the 2 October. Postings to 610 Squadron and 91 Squadron followed and on 27 April 1941 he damaged a Do17, probably destroyed a Me109 on 4 June, destroyed a Me109 on the 9th and destroyed a Me109 and damaged another on 17 August.